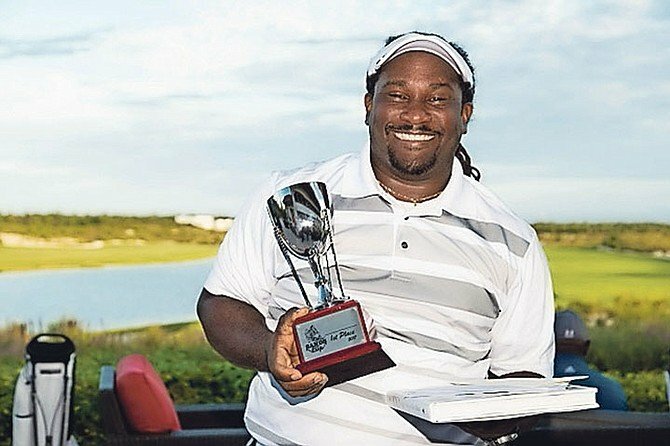 The Bahamas Golf Federation and the Bahamian Brewery & Beverage Company are pleased with the success of the first Sands Beer Cup in 2017. Golfers competed in 11 rounds of golf in 6 tournaments during the year in Nassau, Freeport and Exuma. The final tournament event was held at Albany Golf Course when Ural Pratt was able to hold on to his lead and win the CUP by 3 points over Marvin Bethell, who cut into the lead but was unable to catch Pratt. Bethell finished in second followed by Richard Gibson Jr in third. For his win, Pratt will be the first name etched on the Floating Trophy. He also received a weekend stay for two at the Hope Town Harbour Lodge, Elbow Cay Abaco and two round-trip tickets on Sky Bahamas. The Gross Division was won by Richard Gibson Jr who held the lead throughout the year. The Runner Up was Oren Butler. Ural Pratt also won the Mid-Amateur Division and the Runner Up was Ian Howard. The Super Senior Division was won by Marvin Bethell and Ambrose Gouthro captured the Runner Up spot. Mr Wellington Seymour, Sands Beer’s Executive Sales & Marketing Manager presented the trophies & prizes to the Cup winners along with gift certificates for complimentary cases of Sands Beer products. He expressed his pleasure in supporting the event and confirmed Sands Beer’s Sponsorship for at least the next two years. Mr Glen Archer, the BGF President thanked Sands Beer for their support. He also thanked all the players who participated and commented that the BGF hopes to continue to grow the event and make it bigger and better next year.